Want to find your next big investment? Mine Twitter. Want to spot red-hot startups faster than anyone else? Mine Twitter. It's a trick that CB Insights, a data and research firm, has figured out. And in May, it launched a tool to flag the startups that are rising the fastest. The tool currently tracks and ranks 300,000 startups (mostly in the tech space) across key Twitter metrics like engagement (tweets, retweets, favorites), follower growth and mentions. The Twitter tool is part of CB Insights' premium subscription service, which costs $39,000 annually. CB Insights cofounder Anand Sanwal said it already has 300 users. At its core, the tool helps subscribers identify hot startups they might want to partner with or invest in. If a startup is getting mentioned a lot on Twitter, or if a lot of people are engaging with its brand, it's a strong indication that something good is happening with that company, said Sanwal. CB Insights also tracks a startup's funding, which is integrated into the tool. "You can say, show me NYC companies who've raised less than $5 million who are in the top 25% of Twitter follower growth," said Sanwal. But Sanwal said there are also ways to cheat on Twitter (TWTR), which is why the tool also tracks engagement. "If there's a jump in followers but no engagement, it might mean that the brand is buying followers," he said. So CB Insights can also do a separate "sentiment" analysis of tweets to see if people are tweeting positively or negatively about the brand. Using the tool, CB Insights flagged a few startups that are currently bubbling up on Twitter. theSkimm, Blendle and 9gag all are in the top 5% for engagement among the startups CB Insights tracks. New York-based theSkimm is a daily newsletter that's geared toward busy young professionals -- largely women. It's raised over $7 million and is among Oprah's favorite things. Hong Kong-based 9gag, with an impressive 5.6 million Twitter followers, is a humor site that offers ad-free user-generated content. Dutch company Blendle lets readers pay for individual articles from places like The New York Times, The Wall Street Journal and The Washington Post instead of a monthly subscription. 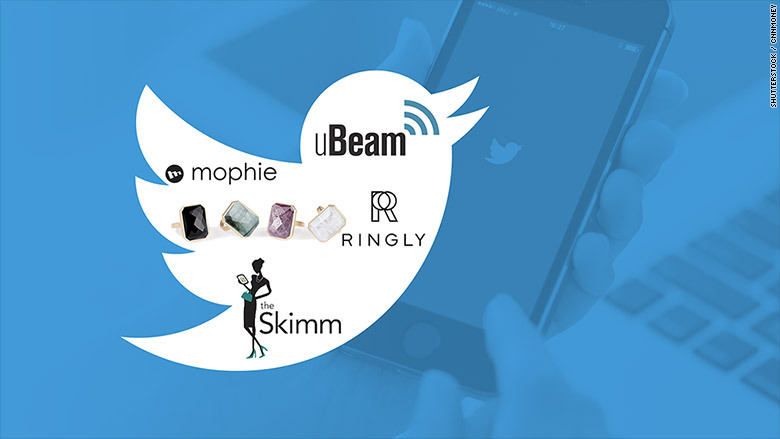 Mophie and uBeam were also some of the startups that users most engaged with on Twitter. uBeam has developed technology that lets people charge their smartphones without having to plug them into a power outlet. The startup, led by 25-year-old Meredith Perry, has raised $23 million from investors like Andreessen Horowitz and Mark Cuban. Mophie, meanwhile makes smartphone battery cases. The brand attracted a lot of attention for its Super Bowl ad this year in which God's phone dies. Rounding out the list are Seattle-based Moment, which makes high-quality photo lenses that attach to smartphones, and wearable tech firm Ringly. The New York-based firm makes rings that light up and vibrate to notify wearers about things like an incoming call or an Uber ride.